This educational journal article addresses the implementation of bioinformatics in the classroom. 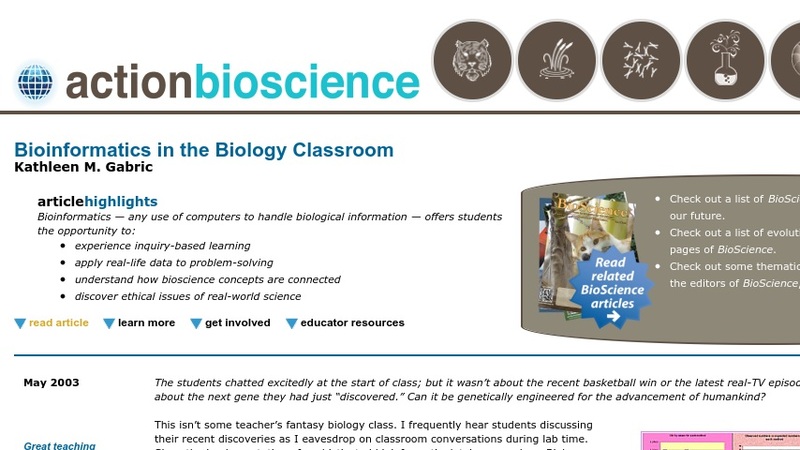 The author explains how bioinformatics could play a key role for science students pursuing higher education, foster inquiry learning of content that has often been taught in a dry manner, provide the thread that ties classes together, improve biology teaching, enhance the learning of biotech issues and ethics, expose students to real-world science, and significantly help to reform biology teaching and improve learning. The article includes links to bioinformatics resources, information about how to get involved in bioinformatics, and a glossary of terms.